Contributed by Louise Adams, Jean Griesen, and Karen Mitchell. Following the Eden Train Tragedy that occurred August 7, 1904. 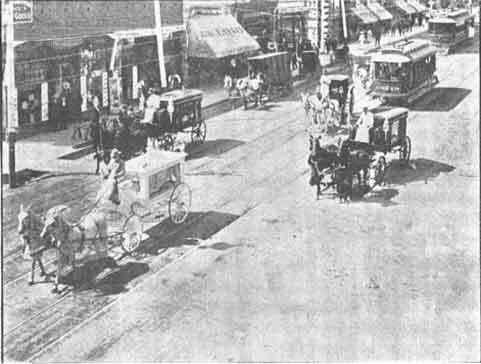 Triple funeral of Thomas family coming down Main Street, near Fifth, showing the three hearses and the carriage containing the four orphaned children. Pueblo, Colo. Aug 8 – Train No. 11, the Missouri Pacific Flyer, crashed through a bridge over an arroya, or dry creek, near Eden, on the Denver & Rio Grande railroad, about eight miles from Pueblo, at 8 o'clock last night. It is estimated that of the 125 passengers on board the ill-fated train between eighty and one hundred lost their lives, either under the water of the raging torrent or beneath the wreckage. Upon the news reaching Pueblo a special train bearing all the available surgeons and Rio Grande and Missouri Pacific officials left for the scene. About 11 o'clock a second train, carrying stretchers, coffins, and a number of police officers, was sent out from the Union station. The alarm was sent out by Fireman Mayfield, who escaped unharmed from the wreck. About 1:45 o'clock this morning the relief train returned to the city, bringing those who had escaped with their lives, about seventeen in all, the only ones, so far as now known, who did not perish in the disaster. Dry creek is fifty feet wide and fifteen feet deep, with steep banks, one mile north of Eden. Water was flowing over a trestle when the train struck it. The engine got almost across, but fell back, and baggage car, smoker and chair cars plunged into the torrent. The engine fell on its right side. The chair car was carried half a mile down Fountain creek. The baggage car and smoker have not been found. Dry creek empties into the Fountain less than a half mile below the wreck. There was no water in the creek two hours after the accident. The diner and sleeper did not go down. The bodies of two women and a girl, the latter probably fifteen years old were the first to be recovered. They were found a half mile below the wreck. They were occupants of the chair car. The bodies were covered with mud and were not identified. The creek is raging and the banks are muddy, and the searchers are meeting with many obstacles. Chief Shoup and twenty five police are there with 200 people assisting. Lanterns and torches are visible along the river for miles. It is thought that 125 persons went down. Undertaker Collier is there, and the bodies are being placed in boxes, carried to the train and brought to Pueblo. The baggage car and smoker were not found and are believed to have been washed down the creek a mile. The engineer was found 200 feet down the river at 2 a.m. The chair car was found a mile from the scene of the accident half filled with sand and bodies covered and buried. The express car was found near the scene of the wreck with the safe open and the contents gone. Pueblo, Colorado – Aug. 8, 6:30 a.m. – The latest estimate of the dead in the awful disaster at Dry creek puts the total at over 100. It is believed that there were fully 125 persons on the ill-fated train, and only about two dozen survivors have been accounted for. The train left Denver with about its normal number of passengers. While some of them got off at Colorado Springs, not less that thirty passengers boarded the train there, so that if the total changed, it is not unlikely that it was increased. With the breaking of day the full horror of the scene, which was concealed to a great degree by the mantle of night, became apparent. Wreckage is visible in all directions, dead bodies being visible here and there in the piles of debris from the cars, driftwood and mud. It will be several hours before the number of dead can be announced with any certainty. Many of the bodies of those who perished were carried down Fountain creek by the wall of water which had force enough to carry several coaches nearly four miles away from the point where they went through the bridge. Denver, Aug.8, - Passenger train No. 11 is the fastest train sent out of Denver by the Denver & Rio Grande. It makes the Missouri Pacific connection for Kansas City and St. Louis, and usually carried a heavy load of travelers. Yesterday afternoon the train was made up of six cars – express, smoker, diner, chair car and two sleepers. Nearly every coach was well filled when the train pulled out of Denver at 5 o'clock. The train makes the run to Colorado Springs in two hours and five minutes, and all went well that far last evening. One hour and ten minutes is the schedule to Pueblo, and the heavy train was whirling along through the storm to make this fast time when it dropped into the stream. Last night the train was in charge of the following crews: James H. Smith, conductor, living at 269 S. Sherman avenue; Thomas S. Rees, messenger the Globe Express Company, living at 1675 Winona street; Henry S. Hinman, engineer, 969 South eleventh street; Thomas J. Turner, fireman, Denver. The first intimation of the accident was received from Pueblo and all advices to the Denver office of the road came from that point. When Division Superintendant Bowren of the Pueblo division was notified from Pinon station by passengers who has escaped and who had walked through blinding rain to the nearest telegraph station, he immediately sent a hurry call for all surgeons and nurses in the city to follow him on relief trains and taking an engine and car, hurried from Pueblo to the scene. One train followed another from the city in quick succession, and every available physician responded to the call, accompanied by a large supply of medicines and a number of nurses. In the meantime measures were taken for the equipment of a hospital train, and that left Pueblo later in the night. The first relief train left the station about 12 o'clock, and a second followed soon after. In addition to the surgeons and nurses a carload of coffins was sent to the spot. Superintendent Bowren arrived on the scene first and immediately communicated with Denver. Pueblo, August 8, 1904 - Denver and Rio Grande passenger train No. 11, (Missouri Pacific World’s Fair Flyer) south and east bound, crushed through a bridge over the arroya of Dry Creek, near Eden, a small station eight miles north of Pueblo, at 8 o’clock last night. The latest estimate of the lives lost places the total number at 100 or more. Dry creek is fifty feet wide, fifteen feet deep, with steep precipitous banks. Water was flowing over the approaching trestles, as the result of a cloud burst back in the foothills. The engine had almost got across the bridge when it slipped back and with the baggage car, smoker and chair cars plunged into the raging torrent. The engine fell on the right side. The diner and Pullman did not go down. The operator at Eden nearly a mile away heard the cry for help and rushed to the scene as soon as possible. When the news reached Pueblo, a rescue train was rushed to the wreck, and soon two hundred people were patrolling the river for miles with lanterns and torches. The express car was found near the scene of the wreck with the safe opened and the contents gone. With the breaking of daylight this morning the full horror of the scene became apparent. Wreckage is visible in all directions, dead bodies being seen here and there in the piles of debris from the cars, drift wood and mud. Many bodies were carried down Fountain Creek by the wall of water which had force enough to carry several coaches nearly four miles from the point where they went through the bridge. The body of engineer Hinman was found 200 feet down the river. The chair car was found half a mile from the scene of the accident half full of sand in which is buried many bodies. The smoker was washed still further down and was not located for several hours. Pueblo, Noon - Up to this hour the number of bodies recovered approximates thirty. Special trains are leaving every few minutes and thousands of persons are patrolling the banks of Fountain Creek, into which the cars were carried by the flood, searching for bodies; but the stream is so swollen that little progress can be made. Owing to the fact that the conductor’s list of names was lost in the confusion following the accident, only an estimate of the dead and missing can be had. Shortly after daybreak, hundreds of persons began swarming to the scene of the wreck and the banks of the river were lined with people watching for bodies which might float past. At 11 o’clock the river began receding below the scene of the wreck and bodies are now being discovered on the sand bars partially covered with mud. They are being brought to this city and are taken to the morgue. Eleven bodies have so far been identified. They are: Miss Irene Wright, Pueblo; Major W. H. Wilham, Kansas; Dorothy Johnson, Pueblo; J. S. Reese, express messenger; Charles Hinman, engineer; J. B. Smith, conductor, and his wife, Denver; A. E. Hoes, Mrs. John Molitor and two children, Pueblo. Twenty-four other bodies are not yet identified. In addition twenty-two more are known to be missing. A force of nearly five hundred men are now at the wreck. Many persons reported lost earlier have since been located and many of them had narrow escapes, some being severely hurt. The list of missing, however, has been considerably augmented and every few minutes adds to the horrible details of the story. Passenger train No. 11, known as the Rio Grande & Missouri pacific World’s Fair Flyer, is the fastest train sent out by the Rio Grande, and usually carried a very heavy passenger business. Pueblo, August 9, 1904 - Deep gloom has settled down upon the city today following the railroad horror, which snuffed out a hundred or more lives yesterday. Many business houses are closed out of respect to the dead and more than forty private homes are darkened and in mourning. The calamity is the heaviest ever fallen upon this city. Entire families have been wiped out, an instance being that of J. Q. Thomas, commercial agent of the Santa Fe railroad, who together with his wife lost their lives in the raging waters. All night long the search was kept up and an occasional body was located, but in the darkness the work was necessarily slow. Most of the treacherous streams emptying into Fountain River, into which nearly all the dead bodies were washed, this morning has fallen to nearly normal and the work of rescue will be much easier, although still dangerous from quick sands, which delayed the work yesterday. This however, does not deter the workers who took up the work again this morning. Bodies have been found more than ten miles from the scene of disaster and reports of bodies even farther are heard. The death list as compiled this morning shows a total of sixty-six identified bodies, total known to be missing twenty-eight and unidentified six, making an even hundred lost. This list will likely be added to during the day. Mayor Brown issued a proclamation today calling for a public meeting for the purpose of arranging a patrol of the Fountain and Arkansas Rivers in the hope of finding more of the victims of the wreck. Hundreds of men have responded to the call and the work has been taken up under the direction of officers. The railroad situation is improved this morning over the Rio Grande tracks and traffic was resumed. At 10:30 a train bringing in two more dead bodies reached this city. Another train carrying one hundred searchers left the city at 11 o’clock. The body of a woman about twenty-five years old, handsomely dressed, was found twenty-two miles down the Arkansas River and brought here to be identified. Later - The body of A. M. Schmiltz of Denver has been found six miles down the Arkansas River. A rigid investigation of the wreck will be made by a coroner’s jury impaneled this morning. The inquest will begin at 2 o’clock this afternoon and an effort will be made to fix the responsibility. The jury went to the scene of the disaster at 10 o’clock this morning. Complete return from all the undertaking establishments in the city up to 2 o’clock this afternoon materially reduces the death list; and according to official figures it shows sixty-three identified and two unidentified dead bodies. A number are still reported missing and how many of these are really dead will probably never be known. The finding of bodies seems to have practically ceased. Pueblo, August 10, 1904 - Undertakers and liverymen were severely taxed in supplying hearses and vehicles for the funerals of the wreck victims today, but all were finally accommodated and soon long lines were wending their way to the various cemeteries. The search for victims was resumed at daybreak today but the chances of further finding of the dead grow fainter as time passes, although many persons supposed to be victims are as yet unaccounted for. The work of identification has been difficult and names have been duplicated with trifling variations, thus swelling the list. The identified dead as reported this morning with additional bodies discovered yesterday make the list of identified dead seventy-one, three still unidentified and twenty-eight missing. The coroner’s jury was brought together again this morning and resumed its investigation. List of Dead and Missing in Sunday’s Railroad Wreck - Denver, August 9 - The Republican this morning says: At the hour of going to press seventy-four bodies had been recovered and identified and the closest estimate put the total death list at 106 from the wreck on Sunday night of the Denver & Rio Grande Railroad, near Eden station, seven miles north of Pueblo, making of it the greatest railroad disaster that Colorado has suffered and one of the most disastrous in the history of the country. It will take days to determine the actual number of persons who perished. The wall of water that hurled itself upon the foremost part of the train as the latter was passing over a trestle that spanned the arroya carried the engine, baggage car, smoking car and chair car down to the creek as if they were pieces of float, and as the two cars, loaded with passengers, began to break the bodies were caught in the flood and carried to the Fountain river, which in turn empties into the Arkansas river, and search is being prosecuted in both rivers for the dead. The train was cut in two: The two Pullman cars and dining car remained on the track, the coupling having given way as the smoking car plunged into the abyss, leaving the end of the nearest Pullman hanging four feet over the abyss. Of the hundred or more people in the two cars that plunged into the torrent, but three escaped and their escape, as was that of the fireman on the engine, was miraculous to a degree. All the others in the cars were drowned. The three who escaped did so through the roof of the smoking car being battered in as the huge wall of water that fell from the skies a few miles nearer the foot hills tossed the cars hither and thither in what was a few minutes before a dry, sandy creek. The monster engine was dragged by the water a considerable distance and one of the cars containing the passengers was found almost a mile from the wreck, such was the tremendous force of the waterspout that went crushing down what is known as Dry Creek. The passengers had no warning. The pilot of the engine had almost reached the end of the light trestle that spans the hundred feet of arroya, when the full force of the wave struck it and carried with it every part of the train that was then on the trestle into the seething tide, tossed the engine and cars and rolled them over and over in its fury. Death to most of the passengers must have been sudden and in all probability painless. They were drowned. The bodies of those recovered show few bruises. But as the cars broke the dead bodies were carried on and often buried in the sand. As the train was from Denver bound for the World’s Fair at St. Louis, a number of Denver people were lost; but the heaviest burden of the disaster will fall on Pueblo. The following lists indicate the number of identified dead and the missing. Denver, Aug 9 – The Republican this morning says: At the hour of going to press seventy-four bodies had been recovered and identified and the closest estimate put the total death list at 106 from the wreck on Sunday night of the Denver & Rio Grande railroad, near Eden station, seven miles north of Pueblo, making of it the greatest railroad disaster that Colorado has suffered and one of the most disastrous in the history of the country. It will take days to determine the actual number of persons who perished. The wall of water that hurled itself upon the foremost part of the train as the latter was passing over a trestle that spanned the arroya, carried the engine, baggage car, smoking car and chair car down to the creek as if they were pieces of float, and as the two cars, crowded with passengers, began to break the bodies were caught in the flood and carried to the Fountain river, which in turn empties into the Arkansas river, and search is being prosecuted in both rivers for the dead. The train was cut in two. The two Pullman cars and dining car remained on the track, the coupling having given way as the smoking car plunged into the abyss, leaving the end of the nearest Pullman hanging four feet over the abyss. Of the hundred or more people in the two cars that plunged into the torrent, but three escaped and their escape, as was that of the fireman on the engine. Was miraculous to a degree. All the others in the cars were drowned. The three who escaped did so through the roof of the smoking car being battered in as the huge wall of water that fell from the skies a few miles nearer the foothills tossed the cars hither and thither in what was a few minutes before a dry, sandy creek. As the train was from Denver bound for the World's Fair at St. Louis, a number of Denver people were lost; but the heaviest burden of the disaster will fall on Pueblo. The following lists indicate the number of identified dead and the missing. These lists have been compiled as accurately as possible, and have been checked up by the Denver & Rio Grande officials and those in charge of the undertaking establishments at Pueblo. It is probable that some few errors may be found, owing to the difficulty of securing a correct spelling of names in some instances, which may have lead to duplications in one or two instances. As the lists now stand they show a total of 106 dead, of whom seventy-four have been found and identified and thirty-two are missing. Having been on the wrecked train on the night of the 7th, it was but natural that we have been persistently questioned about it, and perhaps it may be as well to adopt this method of telling all we do know about it. My daughter, Mrs. Everard Roscoe (Bessie Galbraith) of Goodlettsville, Tenn., with her 3-year-old daughter, Agnes, having spent the summer visiting us, was on her way back home. I had accompanied them to Denver and having secured them a berth on the St. Louis train, which left Denver over the D.&R.G. at 3 o'clock p.m., running from Denver to Pueblo as a D.&R.G. train, and from Pueblo to St. Louis as a Missouri Pacific train, I boarded the train with them, expecting to leave them at Pueblo, they to journey on to Tennessee alone, while I should take the first train at Pueblo for Florence, where the Great Council of Red Men was to meet. At Denver, while waiting for the train to start, Bessie, who was sitting next to the window called my attention to the great number of women and little children who were boarding the chair car in front of us. When Colorado Springs was reached there was a crowd of people, whom we afterwards learned were excursionists from Pueblo, who boarded the train. At this place Bessie, who was looking out of the window, said: “I never saw so many women and babies traveling before.” When Fountain, a few miles out from Colorado Springs was reached, everything had the appearance of a recent rain, snow, or hail storm. It was just getting dark, and piles of either snow or hail were lying on the platform. It attracted the attention of several of the passengers in our coach, who, evidently, were not used to such a sight in August, and they were excitedly talking about the snow. I rather think it was hail, but did not examine it closely. From Fountain to the place of the wreck the train ran slow, considering the schedule time – I should not say to exceed fifteen miles an hour, possibly not exceeding ten. We counted 29 men, women and children who had been in the sleepers and dining car which was in the rear. We knew that we had been saved from hurt or injury, but not one of us huddled there in the darkness could say what had become of the engine and forward cars. Not one of us had seen them go down, and even the hope against hope was expressed by us that the engine and missing cars had gotten safely across before the bridge went down. We gazed down into the dark waters as they rushed along and wondered if they could tell us what fate had befallen those in front of us, but they answered us not a word. We wandered up and down, up and down the bank of the rushing torrent, shouting to attract the attention of any who might be in distress and need of aid. Our shouts were answered by echoes alone. The stars came out and glimmered and glistened as they have glimmered and glistened for countless millions of years before, and who could think that they looked down so complacently upon a wreck so terrible. We built a fire on the bank of the roaring waters and its fitful glare, kissing the filthy waves but made our thoughts more gruesome. It must have been an hour and a half, perhaps two hours, after the wreck, when a man with a lantern appeared on the opposite side of the arroya and asked us how many were left. We then asked him who he was and he replied that he was the fireman. We asked him: “Where is the rest of our train?” and he said “Down there in the water." Alamosa Journal 8-26-1904 The Denver & Rio Grande Railway Company has contributed $2,000 additional to the fund being used to search for victims of the Eden disaster. At Least 110 Meet Their Doom. Roll Call of Missing Shows That Number Answered the Death Call of the Flood at Eden – Graphic and Thrilling Stories by Gazette Staff Correspondents Who Hurried to the Scene. Score of Missing, Buried in the Sand, May Never Be Found, by W. F. Conway. With the stillness that follows death, night settled down over the Fountain valley last night. A hundred lives lost in a maelstrom of seething steam and roaring waters. Bodies torn and limbs shattered and human souls hurled into an eternity without warning. Widows and orphans made and homes broken in a single moment. The very thought is horrifying. Hardly had the curtain of sleep closed upon the tired eyes of scores on that wrecked train, than they were sent to a sleep that knew no wakening, their forms mangled beyond recognition or carried down the stream for miles, some to be recovered while for others the search may be for years, they may never be found. The little woman, who, with her two friends walked up and down the banks of the stream yesterday, wringing her hands and crying out in her anguish – will she ever find the one she is looking for? Those workers in the river's bed who are moving steel and iron and heavy timbers in their efforts to locate bodies – will they find the one whom this woman is looking for? And yet she is only one of scores of people who waited and watched for some word or sign of recovery from the searchers yesterday. They had come in the night, many of them, when news of the disaster first reached their ears, had remained all day and into another night and – they are still waiting. The little piece of black gown torn from under an imbedded coach – the umbrella picked up near by – of whom had they been a part? This one, maybe – and no; the shade of black did not exactly match the traveling gown or the quality of the goods was not the same – it must be some one else that the searchers were uncovering from the debris! Disappointment again that the body they were looking for had not been recovered, and yet relief – for was it not better to know they were only “missing,” than they were really dead? But the suspense, again. It was so bitter to hear. And so it was that thousands of people looked on at the watchers and waiters yesterday. So it was that the friends and relatives of the lost walked up and down the banks of the creek, or stood about in groups of their friends tearfully awaiting any news that the workers might have for them. All day long the organized crew of searchers carried off their work and all day long the surgeons were on hand to render assistance which they knew would not be needed. And the “dead wagons” would come and go with their burden and with those who had loved it in life following closely behind. And scores there were for whom no relative or friend mourned. They were the “unknown” who had gone to their awful death without any claim upon their life – those who had perished without seemingly the knowledge of anyone, and yet who will be “known” in due time, when those who care the most, learn of the terrible fate they met on No. 11. The words were the last spoken by Engineer Charles Hinman. Hardly had they died from his lips, when the monster locomotive, whose throttle was in his hand, went down into the raging torrent, that only a few minutes before had carried away the trestle over Steeles Hollow, near Eden. A cargo of human freight, numbering over 100 souls, was carried down with the engine. Without warning the locomotive, baggage car and two passenger coaches were plunged into the seething waters, dropping thirty feet through the trestle. They were carried along the crest of the huge wave a distance of half a mile or more down the stream. Two Pullman cars and the diner stopped at the brink of the chasm, and, as if by a miracle, the passengers in them were saved. The accident occurred at 8 o'clock at a point about eight miles north of Pueblo, and was by far the most disastrous ever recorded in the history of western railroading. Of the total number of 149 on the train, not over 60 (50?) were saved, the other hundred going to death that was as sudden as it was terrible. Even those in the coaches that remained on the bridge did not know what had actually happened until several minutes had elapsed, so instantly were their companions killed. Those who were not victims of the wreck, which literally tore many limb from limb, were swallowed up in the angry waters and drowned in a few seconds. Bodies were carried a distance of ten miles down the stream, and all of yesterday and through last night searching parties were at work looking for lost ones. Engineer Hinman's command to “put out the torch,” was addressed to his fireman, Frank Mayfield. The latter was standing in the gangway of the engine, torch in hand, anxiously peering into the night to see what destruction the cloudburst of the early evening had wrought. Both engineer and fireman had been watching for danger signals, and the train, Missouri Pacific No. 11, was running at a low rate of speed, not over 15 miles an hour. The 96-foot trestle which spans the arroyo at Steeles Hollow, had been approached without warning of danger, and not until Engineer Hinman felt the tremor of his locomotive did he know the fate that awaited him. Seeing for a brief second the fate of his train, he evidently thought by his injunction to avoid fire that he supposed would spread from the torch in his fireman's hand. All the occupants of the cars, that went down save three men, perished, and had not the roof of the chair car burst asunder none would have escaped. The fireman in the locomotive went over, was thrown out and, managing to grasp a piece of wreckage from the bridge, floated with that to a curve made by the caving bank and crept out of the water. He ran toward Eden, meeting on the way Operator F. M. Jones and his wife, who had already started up the track. They had seen the headlight of the approaching train. Colorado Springs Gazette – August 9, 1904 – Porter Sales Saved the Cars. Prompt Action of Pullman Man Saves the Lives of Sixteen Passengers on the Train. Two Pullman sleepers and a dining car, the only three cars which remained on the track, were brought back to Colorado Springs yesterday morning. It developed that W. M. Sales, of St. Louis, the colored porter on the Wyuta, by his prompt action probably saved the lives of the sixteen passengers who were in the Pullmans. He was seated in the front end of his car, and when he felt a sudden jar jumped up and pulled the emergency air brake, which locked the wheels. As the three coaches came to a stop the front trucks of the Wyuta were hanging over the abyss, where the trestle had formerly stood. When the passengers realized what Sales had done, they were deeply grateful for his prompt action. It required two engines and nearly a half hour's work to pull his sleeper back from the brink of the chasm. Gloom Pervades the Whole City. Pueblo Mourns For Victims of Eden Bridge Disaster, Now Lying at Morgues. – A Day of Anxiety. A deep gloom settled over the city of Pueblo yesterday as a result of the terrible catastrophe. A large number of the killed are Pueblo people, and anxious friends and relatives awaited every item of news with deep interest. Business was practically suspended except that which needed immediate attention and the attention of the city turn with one impulse to the great calamity at its doors. Thousands visited the scene of the wreck and there, noticeable even more than anywhere else, was a feeling of sadness. Every funeral train that arrived in the city was met by large crowds eager to get a glimpse at each cold form, hoping to discern if possible any familiar features among the bodies. The four morgues were crowded all day long and late into the night with those seeking their dear ones. With tearful eyes many persons recognized a friend or relative. Mothers searching for sons, or daughters, sisters for brothers, friend for friend – at every turn, it was the same question. Teller County People on Wrecked Train. Cripple Creek, Aug. 8. – From what can be learned from the railroad office the only passengers from the district on the ill-fated train were as follows: Albert Newton, aged 16 years. The young man was on his way to Telluride where he was going to live. Mrs. James McClosky, wife of a pitcher now playing in the Nebraska state league, was on her way from this city to her husband. Her stepmother, who is a Mrs. Shields, resides in west Denver. Mrs. J. Keating, daughter of Mrs. Lynch of Victor, but for the just two weeks residing in Pueblo, has been spending the week here to witness the marriage of her sister. Ethel and J. I. Thomas and one unknown lady, whose whereabouts or relatives cannot be learned. T. S. Reese, the express messenger who was killed, only left the employ of the Short Line three weeks ago and up to that time had been running through the district every day. Colorado Springs Gazette – August 9, 1904 – News In This City – Local People Alarmed About Their Friends – Springs People in Wreck – Several of Those Among the Dead Formerly Lived here – One Was a Local Resident – Some Sad Stories. The deepest interest was manifested throughout Colorado Springs from the moment the news of the great disaster became public through the columns of the Gazette. The fact that some 40 or 50 persons had taken the train in this city caused much excitement and alarm among their friends in Colorado Springs, and constant inquiries were made at the Gazette office to learn the latest details of the wreck. Though few of the persons who went to their death were permanent residents of this city, fully a score of them had relatives and friends and were well known in the city. A number of them had spent Sunday here while others had been sojourning at the hotels in the Pike's Peak region for several days past. John Bishop, architect in Pueblo, and his sister, Esther, have been identified among the dead. Their cousin, Carrie Bishop of Hartford, Conn., who was with them on the train is among the missing. This was a party who had spent a month at the Red Mountain cottages in Manitou. It is a peculiarly sad case owing to the fact that Mrs. Bishop lost her husband in a railroad wreck last year. The three were going home to make preparations for the return of the rest of the family. Carrie Bishop is the only child of the widowed mother. The death of Miss Annie Pine of the Colorado Telephone company, is perhaps one of the saddest stories connected with the wreck. She had been visiting her sister, Mrs. Weaver, of Colorado Springs, who for the last two or three weeks has been in a critical condition as the result of a surgical operation. On Sunday she was so much improved that her sister decided to leave that night which she did only to meet death a short time later. The physicians have hesitated telling Mrs. Weaver for fear of results which might ensue. George England, a brother of Frank England, was among those who met death in the wreck. He was a resident of Pueblo, but was in the city yesterday visiting his brother, who is a lawyer with R. J. Bolles. George England worked in this city at W. N. Burgess's store a short time ago. He leaves a mother in Pueblo. Frank England left early yesterday to find out if his brother's body had been recovered, and if so to take charge of the remains. Miss Florence Walker, one of the Colorado Springs victims, was a sister of Mrs. Mary Gibson, 208 N. Wahsatch. She was formerly employed at the Johnson Wilbur store in this city and was for a time cashier of the Giles Mercantile company, of Pueblo. She was visiting her sister in this city on Sunday. The body was brought to this city late last night. Alexander Maxwell, another of the flood victims, was a nephew of M. A. Kershaw, of 1304 South Tejon street. He was formerly employed by the Out West Printing company in this city, and later went to the Chieftain in Pueblo. He had been visiting his mother in Denver on Sunday. The remains will probably be brought to Colorado Springs. Mr. and Mrs. H. S. Gilbert. Among the passengers were Mr. and Mrs. H. S. Gilbert, of Oklahoma City. They had been visiting Mr. Gilbert's uncle, S. M. Proudfoot, at 309 East St. Vrain street. Mr. Gilbert survived, but his wife is among the missing and it is feared that her name will be added to the long list of dead. Mr. Gilbert is a Western Union wire chief at Oklahoma City. Two of the drowned are Miss Irene Wright and her niece, Dorothy Johnson, daughter of Harry Johnson, the well-known merchant of Pueblo. They had been visiting Miss Wright's sister, Mrs. Thomas Bayne, of 1215 Colorado avenue. A marvelous escape was that of J. M. Killin, of Pueblo. He was in a car that went down the stream, but he managed to get out in safety to the shore. He has a few bruises and cuts. Mr. Killin was in the city on Saturday, and refereed the shoot between J. W. Garrett and Joe Rohrer. J. M. Killin's family are at the Scott cottage on Canon avenue in Manitou and spent many anxious hours on Monday until definite word was received of the father's safety. H. G. Crabbe and Miss Duncan of Salt Lake City who were saved in the wreck were visitors in Colorado Springs on Sunday. By a rather strange coincidence they came very near missing the train and only boarded it as it was pulling out of the station. Another person who feels grateful for a change of plans is A. F. Middagh, general land agent of the Illinois Central railroad, at Chicago, who, with his wife and father, has been visiting in Manitou. Mr. Middagh's father left for home Saturday night and the son fully intended leaving Manitou Sunday night in time to connect with the Missouri Pacific train for the east. It was only at the last moment that he changed his mind. His wife would have accompanied him and he believes that it is only to the sudden change of plans, however inspired, that they owe their lives. The death of T. S. Reese, well known here, is peculiarly sad, as he leaves in Denver a widowed mother and a sister of whom he was the sole support. He has kept his mother and sister for a number of years. J. G. Graham, who is numbered among the victims of the wreck, was well known in Colorado Springs. As the insurance agent for the Brotherhood of American Yeoman, he traveled over a large section of territory and had many friends in this city. Among those who knew him intimately is Mr. Chas. P. Bennett, with whom Mr. Graham dined in Colorado Springs on Sunday. Mr.Graham was on his way east to visit his father, who is 104 years old, when he met his death. Henry S. Gilbert, who is wife chief of the Western Union Telegraph Co., at Oklahoma City, wandered for hours and went raving mad over his anxiety about his wife. The physicians quieted him and had him transferred to the hospital at Pueblo but it is feared that he will lose his mind. The exposure has greatly weakened him and the thought of his wife sends him out of his head for long periods at a time. He had but recently been married and was on his honeymoon when the cruel waters snatched his bride from his arms. Mrs. Gilbert's body is among those identified at the morgue in Pueblo. A Wall of Water Seemed to Sweep the Three Fated Cars Away Into the Darkness – No Cries for Help Were Heard. Pueblo, Colo., Aug. 8. – Fireman Mayfield arrived here dazed and almost insane because of the awful ordeal he passed through, yet each little incident is fixed so firmly in his mind that he will remember them until his dying day. “It all happened so quickly – and, my God, it is so terrible,” he said. “A little while before we reached the bridge that crosses Dry creek I turned to Charley Hinman, the engineer, and said to him: 'Charley, is there enough steam to carry us to Pueblo?' Charley said 'No,' and I began firing up. “Just as I was putting the second shovelful of coal in, the engine gave a lurch upward. I lost my balance and was thrown from the train on the bank of the creek. I must have struck partly on my head, as I was dazed and did not know what happened for several minutes. When I came to I saw the Pullman cars standing near me, but could not see the engine or the rest of the train. I went up and down the stream looking for my partner, Charley, the engineer. “I didn't notice whether water was running in over the trestle as we approached the bridge, but when I was thrown out the water was much higher than the tracks. “After a long time I met a body of men, who told me to go with them, but I wanted to go find Charley and didn't want to go with them. Then they said Charley was dead, and his body was found near Eden. R. Brunazzi, superintendent of the dining car service of the Denver & Rio Grande, one of the survivors had a narrow escape. “I was sitting in the front end of the forward sleeper Wyuta,” he said, “near the door. The train had slowed up on account of the bad condition of the tracks, and I think we were going about 15 miles an hour, when all at once I felt a sudden jolt, then a terrific crash and our car turned almost on its front end. I rushed to the platform and saw before me nothing but a black, raging torrent with three coaches whirling down the stream. It was horrible. I have never experienced anything like the awful sensation that came over me when I saw the cars, packed with human beings, floating down that flood. The water was rushing against the banks with terrific velocity, and no human being, it seemed to me, could ever withstand that awful current. The most remarkable escape from death that the railroad officials have yet learned in connection with the wreck was that of J. M. Killin, a well-known hardware merchant of Pueblo, one of three occupants of the chair car, who came out of the wreck alive. Mr. Killin was badly cut about the head, hands and arms, but no bones were broken and he will be entirely recovered within a few days if not serious complications ensue. His escape was due entirely, he believes, to his ability as a swimmer, his great strength and his presence of mind, which led him to hold his breath while he was submerged with the other passengers in water. “When the first crash came we were riding along as smoothly as one could go,” said Mr. Killin. “It was just as though the train had struck a stone wall. The lights went out, the fixtures and everything fell down, and the passengers were thrown forward and there were the most awful cries for help and the grinding of timbers. I saw the man next to me was down and I helped him up, but just then another crash came and the train seemed to sink about five feet. I lost sight of everybody and couldn't think of anything but to save myself. I remember well the sensations that I had at that time. I knew I was in terrible danger and my first thought was that I must get out of the car. At the second crash I was about up to my waist in waters. All the time the grinding and crushing of timbers was going on. “In another crash I was thrown about a third of the length of the car right up against the front door. I grabbed the top of the door, and the car went over in the water three times. My first instance when the water went up over my head was to hold my breath. I think I was under water for a full minute. The car naturally righted and when it came up the water was just about my lips. I could breath all right and saw the transom was just above me. With my right hand I smashed out the glass, hoping that I could get out in that way. At that moment another crash came, and I was struck in the forehead by some floating object and dazed, but managed to keep my head above the water and after a terrific struggle reached the shore. “The only man I could see in the coach as I left it was F. H. Messinger, a banker from Central City. He sat just behind me and once came to the end of the car, and it seemed that he would be saved, but before he could be saved he went down and was lost. Mr. Killin was taken to a hospital in Pueblo. Story of E. E. Wilson. One of the most miraculous, if not the most miraculous, escape of the wreck was that of E. E. Wilson and C. C. Nelson. Both men were sitting in the smoking compartment of the forward sleeper itself when it went partly over the brink and the compartment in which these men were was hanging dangerously over the precipice. “The first we knew of the wreck,” said Mr. Wilson, in relating the thrilling experience of those few moments when life was hanging by a thread, “was the mighty rush of water. I stuck my head out of the window, but could see nothing on account of the blackness of the night. But I heard the awfullest, the most agonizing screams I ever heard in my life. It was for a moment only, and then again came the roar of the torrent. When we realized what had happened the handful of survivors set out to give what aid they could. There were sixteen of us, but we were helpless. There was nothing we could do. We lit red fire and lanterns along the banks, but we did not hear a single soul cry out for help. We could hear the banks caving in on all sides. The banks were full and the current was swift. The wall of water must have been about twenty feet high, and for two hours the creek was raging. Mr. Wilson is a resident of Coffeyville, Kan., but is spending the summer with his family at 1120 North Weber street. He was bound for his home in the east for a short trip. Mr. Nelson is from Fort Worth, Tex., and was also bound for his home. George A. Beck, 721 East Fourth Street, Pueblo, Colorado Mr. Beck is survived by his wife and little child. It is supposed that his sister-in-law Pearl Hopper perished in the wreck. Frank E. Bodman, Northampton, Massachusetts (Pueblo, Colorado) brother of Mrs. E.L. Stevens. Miss Elizabeth Ecklund, Denver, Colorado; A sheet of note paper containing the following sketches was found: "Miss Selma Elizabeth Eckland born in Salemburg, Kansas 31 December 1885. Took my first communion with the Swedish Congregation at Mission Church, South Fourteenth Street, Denver, Colorado on the 10th day of April 1904." J.T. Galbraith (newspaper shows J.G. Galbraith) He was about 33 years of age, a native of Indiana County, Pennsylvania. He has been a resident of Pueblo for several years. So far as can be learned, he has no relatives in this state. Mrs. Kate C. Gartland, Denver, Colorado (newspaper shows Mrs. Edward P. Gartland, 2450 West 38th, Denver, Colorado) Mrs. Gartland perished along with four of her children: Edward, age 11 years; Walter age 9 years; Lillian age 6 years; and Ralph age 2 years. They were survived by husband, Ed Gartland and son Frank, who were not on the train. Walter Gartland, Denver, Colorado (child) body not recovered. Jess Gray (Jesse E. Gray, Denver, Colorado) Jess E. Gray was identified by his brother Jack Gray and uncle U.G. Bowler. He had gone to Denver to spend the day with his father and 2 brothers. William E. Hughes, Pueblo, Colorado - William E. Hughes was born in Columbus, Ohio in 1862. He arrived in Pueblo 17 years ago. Mr. Hughes is survived by his mother Mary E. Hughes and Aunt Laura M. Hughes. Buried Roselawn, age 34, buried 8-9-1904. Dorothy Johnson, Pueblo, Colorado (child) daughter of Harry Johnson, age 8, body never found. Dorothy perished along with her Aunt, Miss Irene Wright. Alexander Maxwell, book-keeper for the Traction company. He was a cousin of B.F. Scribner of the Chieftain. His family resides in Kansas, body not recovered. F.H. Messinger, bank cashier, Central City, Colorado body not recovered. Mizella Miller, age 58, buried 8-13-1904. Dr. Walter F. Munn, Pueblo, Colorado; Dr. Walter Ferguson Munn was born in Glasgow, Scotland, 16 June 1867. He graduated form Anderson College, Glasgow. He then studied dentistry in Northwestern University, Chicago. In 1898 he married Jennie Adaline Wood at Aurora, Illinois. He came to Pueblo December 29, 1897. Dr. Munn was a member of the 1st Presbyterian Church of this city and for many years a loyal Odd Fellow. Just one year ago today he said good-bye to his mother and father in Scotland. On his trip there he was accompanied by Mrs. Munn, Ralph W. Munn, age 10, Walter Wilson Munn, age 4, and his sister-in-law, Miss Emily Wood. Buried Roselawn, age 37, buried 8-10-1904. Albert Newton, Cripple Creek, Colorado body not recovered. Miss Anna Pine (newspaper lists Miss Annie Pine, Colorado Telephone Office, Pueblo, Colorado) Miss Pine has been for 4 or 5 years an operator at the Central Telephone Exchange. She was only 20 years of age and a strikingly pretty brunette. Thomas S. Reese, 1675 Winona street, express messenger, Denver, Colorado; Globe Express Company's agent. In charge of the express car on the wrecked train. Mr. Reese is about 29 years old. He is the sole supporter of an aged mother and several small brothers and sisters. Ralph R. Schwarzkoff (newspaper lists Ralph Swartzcup, barber, Pueblo, Colorado) Buried Roselawn, age 21, buried 8-13-1904. Miss Minnie Selby, 1045 Spruce, Pueblo, Colorado Buried Roselawn, age 23, buried 8-13-1904. Bud Seward, Pueblo, Colorado Buried Roselawn, age 22, buried 8-10-1904. Fred Taylor, Kansas City, Missouri, body not recovered. Miss Florence Walker, Pueblo, Colorado Buried Colorado Springs. Mrs. (Mary C.) George R. West (newspaper lists Mrs. George F. West, former mayor of Pueblo, Colorado) formerly Miss Chancellor of Franklin, Missouri, daughter of William Chancellor of Franklin, Missouri, married George West in September 1899. Mr West died December 1901. Mrs. John Thompson of Virgecille, Montana was Mrs. West's sister. Mrs. West was a member of the Southern M.E. Church. Buried Roselawn, age 38, buried 8-10-1904. Miss Emily Wood, Pueblo; Daughter of Mrs. M.G. Wood and sister of Jesse R. Wood, and Mrs. & Dr. W.F. Munn. She was born in Aberdeen, Kansas November 20, 1872. When 2 years of age she was taken to Aurora, Illinois where she received her education. In 1892 she moved to Chicago, Illinois where she resided for 7 years and from which she came to Pueblo. She was a member of the First Presbyterian Church and a member of the C.E. Society. Buried Roselawn, age 31, buried 8-10-1904. I.W. Wright (newspaper lists I.W. Wright, painter, Pueblo, Colorado) I.W. Wright was the son-in-law of A.C. Foote. Beside his wife, he leaves 2 children aged 6 and 13 years. Miss Irene Wright, (newspaper lists sister of Mrs. Harry Johnson, Pueblo, Colorado) Miss Wright was a decided brunette, about 23 or 24 years old. Her parents are dead. Mrs. Harry Johnson being her nearest relative in Pueblo.